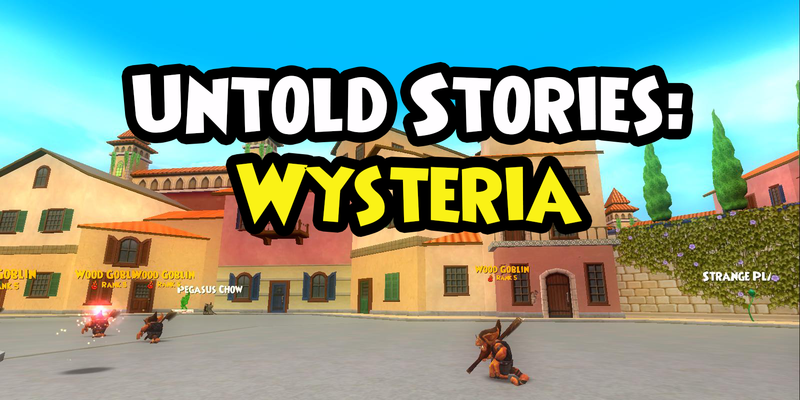 Welcome to Untold Stories: Wysteria. This post will summarize what happened there. Wysteria is a side world. Headmaster Ambrose calls you into his office to give you exciting news. The faculty members have been so impressed with your work that they want you to travel abroad and represent Wizard City in the Spiral Cup. 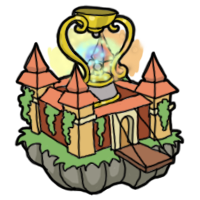 Ambrose tells you that Ravenwood hasn’t taken home the Spiral Cup in a long long time, but maybe you can change that! Mr. Lincoln informs you that the Spiral Cup tournament is held at Pigswick Academy – Ravenwood’s rival school in Wysteria. Before you go, Mr. Lincoln hands you a Ravenwood school ring so that the Pigswick registrar, Mrs. Dowager, will know that you’re Ravenwood’s representative. When you arrive in Wysteria, Mrs. Dowager greets you with a smile. Once she checks your school ring, she sends you to look at the Spiral Cup and meet Benedict Glendemming. Benedict is the Master of Arms at Pigswick, and also judges the Spiral Cup competition. If you want to compete for the Spiral Cup, you’ll have to pass a qualifying round first. After you make short work of your qualifying opponent, Benedict sends you back to Mrs. Dowager for processing. Mrs. Dowager is pleased that you’ve passed the qualifying round and instructs you to meet your fellow competitors. Your future opponents come from all across the spiral – Mooshu, Weirwood, and even Mirage! All of them seem friendly … except for Randolf Spellshine, Wysteria’s representative. Now that you’ve gotten acquainted, you tuck your Ravenwood school ring away in a drawer and head back to Mrs. Dowager. Mrs. Dowager then sends you to meet Pigswick’s headmistress, Belladonna Crisp. Belladonna isn’t the most welcoming person to say the least. She doesn’t think highly of you and wants you to learn what “real” magic is all about. You then travel to each of the magic schools in Pigswick Academy – Earth, Chaos, Frost, Ember, Tempest, Spirit, and Equilibrium. The professors are less than impressive, but Belladonna is convinced that a Pigswick education is the finest around. Belladonna laughs at the fact that Ravenwood students believe a tree is the source of all magic. She then urges you to gaze upon the “true” source of magic … the Fount of Magic. It looks like any other fountain to you. Something isn’t adding up here. When you return to report your findings, Belladonna exclaims that she wants to put your problem solving skills to use in Pegasus Place. Why are you always the one solving everyone’s problems …. Captain O’Hare informs you that Pegasus Place has been taken over by goblins. Once you take care of some goblins, Captain O’Hare sends you to find Groundskeeper Verne. Groundskeeper Verne is the head gardener of Wysteria and knows all about the many plants that grow there. He shares that strange plants have been growing ever since the goblins arrived. Wanting to figure out where they came from, Verne instructs you to collect some samples so he can track down their origins. While Verne examines the strange plants you brought him, you go and help out Lapin Wingtamer at the Pegasus stable. Lapin tells you that he saw where the goblins came from – a huge portal! You inspect the portal, but decide not to do anything without fully understanding the situation. Verne informs you that the plants you collected have Weirwood origins, and he assumes the portal must be connected as well. One of your fellow Spiral Cup competitors, Beatrice Wildwind, is from Weirwood. Best go talk to her and see if she knows anything. Beatrice identifies your strange plant as Wild Viridian. Apparently the goblins like to use it as a seasoning. She assures you that anything weird happening in Wysteria is their doing, and she’s even willing to help you close the portal. Beatrice directs you to an incantation which you can use to dispel the portal. Once you gather the needed ingredients, you head back to Verne and tell him the good news. Verne is excited that you’ve found a way to close the portal, but you’re missing one very important thing. You need a soul-stone to power the incantation. Needing one to finish your mission, you confront the leader of the goblins, Lord Graustark, and take his. Using the soul-stone and Beatrice’s incantation, you’re able to successfully close the goblin portal. Woohoo! Surprisingly, Belladonna is impressed. Your first tournament match is about to begin! Mrs. Dowager tells you that it’s tradition for Pigswick students to knock on the Spiral Cup when they want good luck for a test. Perhaps you should do the same for the tournament! When you make your way there, you notice a huge problem. The Spiral Cup is missing! Benedict has no idea where it is and sends you back to Mrs. Dowager. Mrs. Dowager tells you not to worry. She has faith that the Spiral Cup will be returned. In the meantime, your first tournament duel is set to commence. Even though the prize is missing, the tournament will not be delayed. Your first opponent is Kisai Shugenja from Mooshu. You beat him honorably and inform Benedict of the match result. Benedict says that he examined the area and found a clue as to who stole the Spiral Cup. He gives the evidence to you and sends you back to Mrs. Dowager. Mrs. Dowager urges you to tell Belladonna of the troubling news. When you arrive, Belladonna examines the evidence and asks you to fetch your school ring. When you go to retrieve your school ring from the dresser you put it in, you realize that it’s gone. Belladonna is not surprised … it turns out that the evidence Benedict found was YOUR Ravenwood school ring! Belladonna questions if Headmaster Ambrose is desperate for the Spiral Cup and sent you to Wysteria to obtain it by trickery. However, she isn’t stupid. Belladonna admits that leaving such an obvious clue at the scene is a “dunderheaded” move. While you are still a suspect, Belladonna allows you to continue the tournament. Your next opponent is Beatrice Wildwind from Weirwood. Once again you come out of the tournament duel victorious. With that out of the way, it’s time to prove your innocence! You return to the scene of the crime (where Benedict claims to have found your ring) and find some leaves, bark, and vine. Needing to identify the strange plants you found at the crime scene, Belladonna encourages you to visit Verne. Verne tells you that the plants you brought him are not native to Wysteria and sends you to Chester Droors, the Earth professor. Chester suspects that you brought him the same kind of plants that are overrunning Tanglewood Way. Unfortunately, that street is closed off to all students. Hitting a dead end, you report back to Belladonna. Belladonna insists that we must stay strong during this trying time by continuing the tournament. You go to the tournament hall for your next match, but Benedict informs you that your next opponent, Nalia Dunestrider from Mirage, is nowhere to be found. You end up finding her in the student dormitory looking very distraught. She’s apparently lost her wand in Tanglewood Way and can’t duel without it. Because you’re such a good sport, you’re willing to enter Tanglewood Way and recover your opponent’s wand. When you do, you notice that the plants there look suspiciously like the ones you found at the crime scene. Nalia is grateful for your help, but she warns you that she won’t be pulling any punches! No matter – you end up defeating her anyway. Now back to the matter at hand! Wanting to explore Tanglewood Way’s connection to your evidence, you return to the fearsome street and fight some Green Men. While doing so, you notice that they move and act as if they’re part of a single being. In addition, their leaves, bark, and vine match your crime scene evidence exactly. You seek out Verne hoping he can connect all the dots, but instead he insists that the Earth professor (Chester Droors) is the expert on the Green Men. Chester apparently studied them on Tanglewood Way when they first popped up and even ordered the street to be closed. Time to go give him a visit! Chester Droors acts like he wants to help you at first, but as soon as you step into his classroom … he turns on you! After you defeat him, Chester asks to speak with you outside and explains the whole thing. Lord Bramble has been controlling Chester and your magic has broken the spell – temporarily. Chester shares that Lord Bramble wants to restore all of Wysteria to the wild state it was in before Pigswick Academy was founded. To do that, Lord Bramble had Chester frame you for the Spiral Cup’s disappearance (to discredit Pigswick and pin it against Ravenwood). Lord Bramble still has Chester’s soul trapped in a wooden doll, and it’s up to you to defeat him and retrieve it. You travel to Lord Bramble’s tower and successfully defeat him. Not only do you recover the wooden doll, but you also find the Spiral Cup! Chester is free and the tournament is saved! Your final tournament match is against Wysteria’s finest, Randolf Spellshine. Though he puts up a good fight, it’s not good enough. You beat him and win the tournament. The Spiral Cup belongs to Ravenwood! Merle Ambrose is pleased to hear the exciting news and tells you that you’ve done Wizard City proud.